Published: Dec. 13, 2018 at 08:34 p.m.
Kansas City Chiefs defensive back Steven Nelson intercepts a pass from Los Angeles Chargers quarterback Philip Rivers pass. Published: Oct. 7, 2018 at 05:14 p.m.
Jacksonville Jaguars quarterback Blake Bortles throws the ball directly into the leaping arms of Kansas City Chiefs defensive end Chris Jones for a defensive touchdown. Published: Dec. 31, 2017 at 06:46 p.m.
Denver Broncos quarterback Paxton Lynch fumbles ball away and the Kansas City Chiefs pick it up for a touchdown. 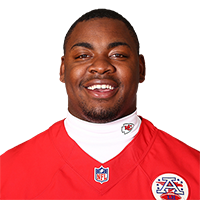 Published: Dec. 10, 2017 at 02:19 p.m.
Kansas Chiefs defensive end Chris Jones pressures Derek Carr, Terrance Mitchell makes diving interception.